Passionflower is a plant in the Passifloraceae family. It is also known by a number of other names including Passion Vine, Water Lemon, Granadilla, Apricot Vine, Maypop, Jamaican Honeysuckle, Passionsblume Kraut and Maracuja. There are roughly 500 species of Passionflower, most of which grow as vines, shrubs, or herbaceous plants. What makes the plant interesting is that it is rich in flavonoids, glycosides, organic acids (i.e. formic, butyric, linoleic, linolenic, malic, myristic, oleic and palmitic acids), phenolic compounds, and amino acids. For this reason, it is not surprising that Passionflower has been used for centuries to treat many health conditions. The food and beverage industry also uses extract from the plant for flavouring purposes. From a health perspective, Passionflower is known for its antibacterial, antifungal, and analgesic properties. It also has sedative, anxiolytic and antispasmodic activity, which is why it has traditionally been used as a calming herb for the treatment of anxiety, nervousness, agitation, sleep disorders (insomnia), and seizures. Recent studies by herbalists also suggest that Passionflower may help with conditions such as Attention Deficit Hyperactivity Disorder (ADHD), Hysteria, Asthma, High Blood Pressure, Gastrointestinal discomfort, Menopausal and Postpartum depression symptoms, Fibromyalgia, muscle spasms, hemorrhoids, burns, and inflammation. It has also been used to relieve the symptoms caused by narcotic drugs or alcohol withdrawal. Passionflower is well known for its calming activity. It contains beta-carboline harmala alkaloids that help reduce the amount of MAO (Monoamine Oxidase). This in turn helps treat anxiety and depression, as well as nervous restlessness. Therefore, drinking a cup of tea made with 1 teaspoon of fresh or dried leaves of Passionflower (Passiflora incarnata/maypop) or its tea bag may help with anxiety, nervousness, agitation, epilepsy and seizures. Simply steep the tea bag or one tablespoon of fresh or dried leaves of Passionflower (Passiflora incarnata) in one cup of boiling water for 7-10 minutes and drink it when it reaches a suitable temperature. Humans have been using Passionflower to treat sleep disorders for centuries. Scientists believe that Passionflower helps increase the levels of an amino acid called GABA (Gamma-Amino Butyric Acid) in the brain which acts as a neurotransmitter. Research indicates that increased levels of GABA in the brain make us feel more calm and relaxed by reducing the production of excitatory neurotransmitters which lead to anxiety-induced sleep disorders. Therefore, drinking a cup of Passionflower (Passiflora incarnata) tea about one hour before bedtime may improve sleep quality. Passionflower is known for its analgesic and anti-inflammatory activity. Therefore applying a passionflower tea bag onto an area of the body that has a minor burn, inflammation, or pain may help relieve discomfort. Simply soak an organic Passionflower tea bag in a very small amount of warm water and let the tea bag absorb that water for about five minutes. Apply that soaked tea bag onto the affected area for 10-15 minutes two to three times daily. Passionflower tea is an effective natural remedy for stomach problems such as indigestion or an upset stomach. Simply drink one cup of Passionflower tea at the onset of minor gastrointestinal discomfort twice daily. If the stomach discomfort is not relieved within three days, it is best to consult your physician to make sure there isn't some more serious issue. For individuals that have mild levels of hypertension but otherwise maintain a healthy lifestyle consisting of a good diet and regular exercise, drinking one cup of Passionflower tea daily has been shown to be beneficial in regulating blood pressure levels. Note that individuals who are taking medication for high blood pressure should avoid this passionflower tea remedy since it may cause blood pressure levels to fall to dangerously low levels. Passionflower is generally safe when taken moderately and for a short duration of no more than two months continuously. To use it beyond two months, it is recommended that it be discontinued for two to three weeks before continuing usage. Some side effects of the plant include dizziness, confusion, altered consciousness, irregular muscle action, nausea, vomiting, drowsiness, and abnormal heart rhythm when consumed in large amounts or for extended cycles. If you notice any of these symptoms, discontinue use and contact your physician. Passionflower is not recommended for pregnant women since it contains chemicals which may cause contractions of the uterus. It should also not be used if you are breastfeeding since there is not enough research to determine how safe it is for infants. If you are taking medication for high blood pressure or are taking CNS (Central Nervous System) depressants, or if you plan to take anesthesia for an upcoming surgery, do not consume Passionflower since it may alter the effects of these medications. Passionflower should also be avoided by individuals that have low blood pressure, since the anti-hypertensive activity of Passionflower may drop blood pressure levels to dangerously lower levels. Passionflower is available in herbal food stores and online herbal websites in the form of tablets, capsules, tea bags or liquid extracts. 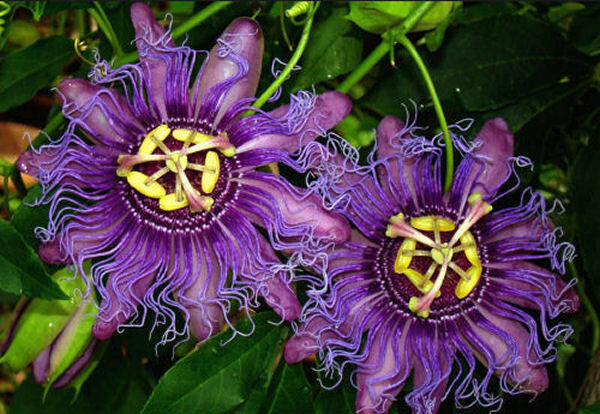 When purchasing Passionflower products, make sure to check that the product is organic and is prepared using Passiflora incarnata/maypop, since this particular species of the plant is the most popular and best understood species from a health perspective. S. Akhondzadeh, et al. Passionflower in the treatment of opiates withdrawal: a double-blind randomized controlled trial. Journal of Clinical Pharmacy and Therapeutics. 2001;26(5):369-373. T. Sano, E. Oda, T. Yamashita, et al. "Passionflower". MedlinePlus article, U.S. National Library of Medicine, March 2015. K. Dhawan, S. Kumar, A. Sharma. Anti-anxiety studies on extracts of Passiflora incarnata Linneaus. Journal of Ethnopharmacology. 2001;78:165-70.